One bit of functionality which Flickr has long been missing is online photo editing. This was a bit of a gaping hole considering Flickr is a site for online photo sharing and storage! 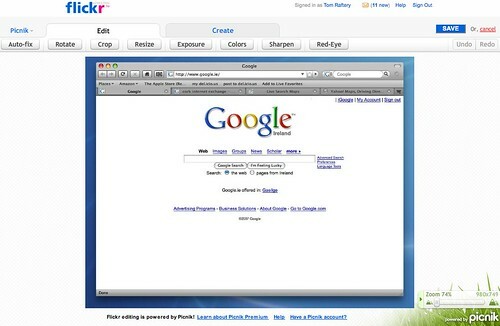 However, Flickr announced yesterday that they have integrated the functionality of online photo editor Picnik into Flickr and it is now possible to edit your photos within Flickr. As you can see from the screenshot below, the editing functions are quite basic as yet, but the great thing about these online apps is that they tend to improve their functionality over time. I’d love to hear Walter Higgin’s take on this (Walter is a friend and CEO of Sxoop Technologies, the makers of Pixenate – the premiere online photo editor).